A crucial part of designing any online platform is to keep your users in mind. You can have the best product or service, but if your employees, stakeholders and/or external associates have an unsatisfactory experience when trying to use your intranet or extranet, things need to change, and quickly. Remind yourself of the obvious questions and constantly refer back to them. Who are your users? What requirements do they have? What would they class as a pleasurable and positive experience? Some of your users may be visually impaired or fully blind. There are a few different but important factors to consider. Blind users are likely to use a screen reader, therefore, you want to make sure that all of your images have descriptive alt text and that videos have transcripts. Furthermore, always remember to write descriptive titles, links and headings instead of generic labels such as ‘click here’. Some users will be fully sighted but may not be able to hear. This means that providing the option of subtitles on videos and audio is vital. It’s important to make sure that the layout of your intranet is logical and linear, not cluttered and unclear. Never force your users to only use their mouse. It’s a must that they are able to navigate using just their keyboard, should they need to. Improving accessibility benefits everyone. For example, it’s not just visually impaired people that will benefit from clear and descriptive titles and headings – you want all users to have an easy intranet experience with quick access to compelling content. When it comes to text, size matters! Small text and/or difficult to read fonts are extremely off-putting and will deter people from using or remaining on your platform. The same applies to colours. The ideal contrast is at least 4.5:1. You want to make sure text is clear and not obscured by too dark backgrounds. Use a free contrast checker such as Webaim colour contrast checker to help you. There are a number of ways to test how accessible your current website or digital workplace is. You can try out a screen reader, or, you could attempt to navigate your site using just the keyboard. 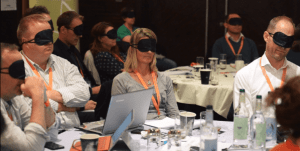 For a more interesting approach, why not put on a blindfold or wear some earplugs and see how easy it is to navigate your intranet? In fact, last year our COO, Paul Zimmerman gave a fantastic talk about digital accessibility, raising awareness on the subject. To demonstrate some of the previously mentioned points, it gave out blindfolds so that the audience could put themselves in the place of those with a visual impairment. It was a complete success, getting people to think more deeply about the topic of accessibility. Click here to watch the talk. Following these simple guidelines can help you ensure that you provide your users with a positive and highly accessible experience. Keep your eyes peeled on our social media next week as we will be releasing another extremely helpful tool surrounding accessibility!